Commercially formulated foods for horses are likely to satisfy any nutritional needs. The thing is that foods of this kind seem boring to most equine. Your horses are going to eat less and less. There is a shortage of essential nutrients. Other diets of fresh whole grains are more tempting to equine but they do not contain enough vitamins and minerals. In both types of feeding, you should always consider adding some supplements to enhance the health of your horses. Keep scrolling down to find out the best horse vitamin and mineral supplement with the buying guide included. How to choose the Best Horse Vitamin and Mineral Supplement? Q1: Is this true that the more expensive, the better for horse supplements? Q2: How much vitamin E do my horses need? Q3: When to review and change the supplement regime? Q4: Do overweight horses need vitamin and mineral supplements? Q5: How long will it take to see an improvement after using horse supplements? 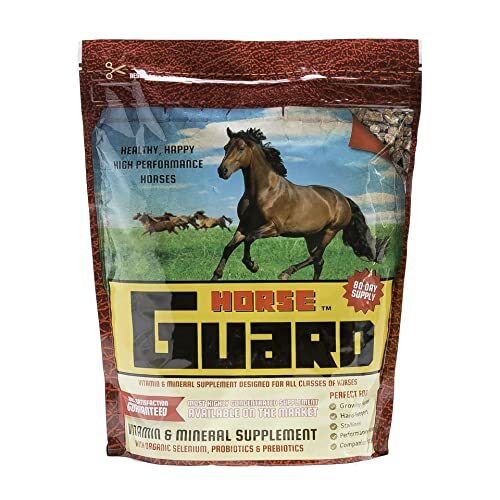 My first recommendation in terms of extra vitamins and minerals for horses is Horse Guard. This is a wholesome extra food with all natural and beneficial ingredients. Organic Selenium and Vitamin E are of great support to accelerate muscle recovery and upgrade disease resistance while powerful prebiotics, probiotics, and yeast help to heal the horses’ guts and aid digestion. There are additional biotin and zinc in the Horse Guard’s formula to ensure the wellness of the equine coat and hooves. Selected and formulated by nutrition experts for horses, Horse Guard is certainly something you can count on. The second position in the list of best horse vitamin and mineral supplements belongs to Vita Flex Accel. It is an all-rounded supplement for the sake of the well-being of your horses. There are up to 14 amino acids in the formula of Vita Flex Accel. Many of them are what equine are often lacking in, for example, isoleucine, leucine, valine. These nutrients are necessary to increase and keep up maintain muscle tissue and avoid protein breakdown. If your horses have regular exercise, they will definitely need it. Furthermore, all the goodies of Vita Flex Accel are easy to absorb. This is because it contains active yeast with natural intestinal microbes and positive microorganisms with a lot of enzymes to make the digestive system work better. 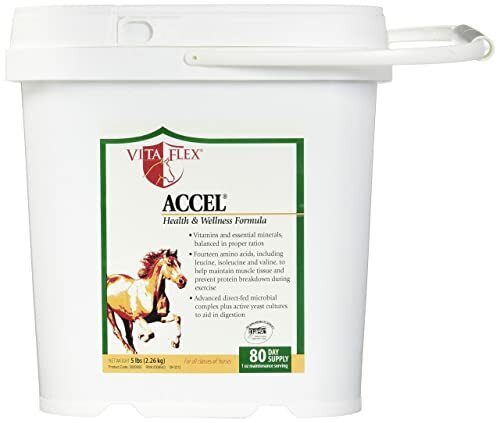 Whichever diets you are applying to your horses, Vita Flex Accel can be added to fortify the positive sides of the feeding program. It is best to provide well-balanced nutrients for daily use. Some horses find more difficult to eat as it can be dry. 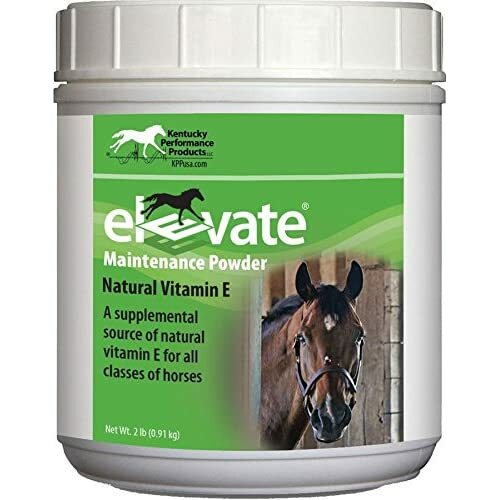 If you are looking for a special, strength elevating supplement for your equine, Kentucky Prod 044097 is there for you. Its ingredient is very simple. Nothing but vitamin E.
Do you know how important vitamin E is for horses’ maintenance? Because equine cannot synthesize this vitamin, they have to consume it directly from food sources that are rich in vitamin E.
Unfortunately, the best vitamin E provider is fresh green grass, which is often not available all year round. That’s when you need to add Kentucky Prod 044097 to the daily diet of your horses. You can either choose the 2-lb container with 130 scoop supplies or the 10-lb with 647 scoop supplies. Each scoop is supposed to have 1,000 IU of vitamin E, which is enough for the daily consumption of your normal equine. Exhaustion among equine is basically caused by dehydration and mineral deficiencies. 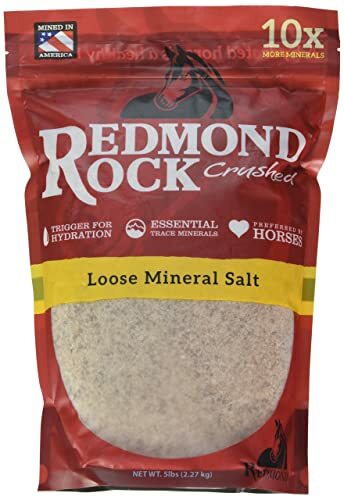 To really boost the strength of your horse, you can additionally feed REDMOND Rock with natural trace minerals to them. REDMOND is actually made from Redmond. All the inside is unrefined, 100% pure sea salt from Redmond salt deposit. There are over 60 kinds of minerals included. The product acts as a trigger for hydrating and also provides crucial salt electrolytes for a healthier life of your horses. You can easily adjust the amount of product in a meal to suit the equine’s health condition. REDMOND works best for those that are a little bit active with extra hard work or travel. Usual usage will be from 1 to 3 scoops per day. 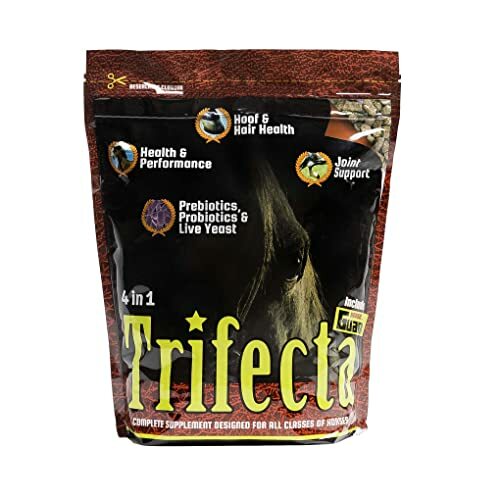 One more product of Horse Guard in my list of best 5 products for additional vitamins and minerals in horse diets is this Trifecta. A 4-in-1 supplement for the sake of your equine. Not only will it supply enough vitamins and minerals your horses need, but it also has a positive impact on the horses’ guts, joints, and hooves. Remember what I said about my top 1 Horse Guard Equine Vitamin Mineral Supplement above? This Trifecta has all those things, and more. The perfect ratio of 5:5:1 per dose is of great benefit to heal sniff and sore joints and prevent any joint problems. Trifecta is a great way to simplify your equine diet, yet still provides a healthy, balanced source of essential nutrients. Equine is vulnerable to joint diseases. The minor ones may only kick of some discomfort to your horses but if you do nothing, the situation will soon get worse and the horses can suffer from great pain. That’s why joint supplements for horses are made. The main ingredient of this type is, of course, glucosamine, which is also known for the human prescription. The older your equine get, the less effectively his or her digestive system works. Therefore, you should add food rich in prebiotics, probiotics or microorganisms to make sure the horse fully utilize all the great nutrients he or she takes in from the daily diet. These antibiotics have some healing effects in case of diarrhea, bloating and mild colics. Whichever your horse’s health condition is, additional biotics are important to maintain a healthy gut. As the saying goes, no hoof, no horse. Hooves are the soul of a horse. Because equine is involved in quite a great number of activities and sports, their hooves can easily encounter such problems as abscess, bruises, thrush, cracks. In fact, no supplements are able to completely heal a cracked hoof. The ultimate purpose of them is to prevent the injuries from happening. Research shows that amino acids, A and C group vitamins and biotin help to strengthen horse hooves, making them less vulnerable to injuries. In addition to speed performance, a beautiful appearance is important to horsemen, too. A healthy horse coat must be healthy from inside out. Best horse shampoo can bring about a brilliant look after a bath. However, that great look cannot remain for so long if inside, there is a deficiency in fatty acids, vitamin E or trace minerals. They are what a horse supplement provides to promote a well-being hair coat. To be honest, it is great up to you whether which kinds of horse supplement your equine need. Equine in need of extra energy demonstrates a great loss in performance and weight. The ability to perform heavy exercise can be the result of mineral deficiency. Inadequate level of vitamin intake leads to a stagnation of body growth and maintenance. In my view, it’s true for most cases. When it comes to vitamin and mineral supplements, there are some kinds of natural, extra good ingredients, so they cost more than the usual, mass-produced ones. Normal equine only requires a pretty amount of 1,000 IU vitamin E intake per day. The nutrition requirements of horses change according to their age and living conditions. As your equine gets into a new phase of his or her life, you will want to review what he or she needs. In the case of too big equine, horsemen will think about reducing the food, which leads to an insufficient intake of vitamins and minerals. The answer is various. It much depends on your horse’s condition and the purpose of adding supplements to the horse diet. In my experience, the REDMOND Rock may give immediate effect, but if I discontinue using, the positive effect soon fades out. As for Horse Guard, I really saw a beneficial change after about 3 weeks, and it lasts even after I stop using. If I have to choose, Horse Guard Equine Vitamin Mineral Supplement will be the first to pop up in my mind. For general use, this product satisfies all my requirements. It can be used for all species of horses with the main function to maintain the wellness of them. The price is also budget-friendly, especially for long-term applications. It is also a great option since it has to promote joint strength. However, for the best joint supplement, I will loosen my budget to get a more effective product. To cut a long story short, most of the basic diets for horses are not enough to ensure their wellness. Therefore, you should think about feeding your equine some of the best horse vitamin and mineral supplement.